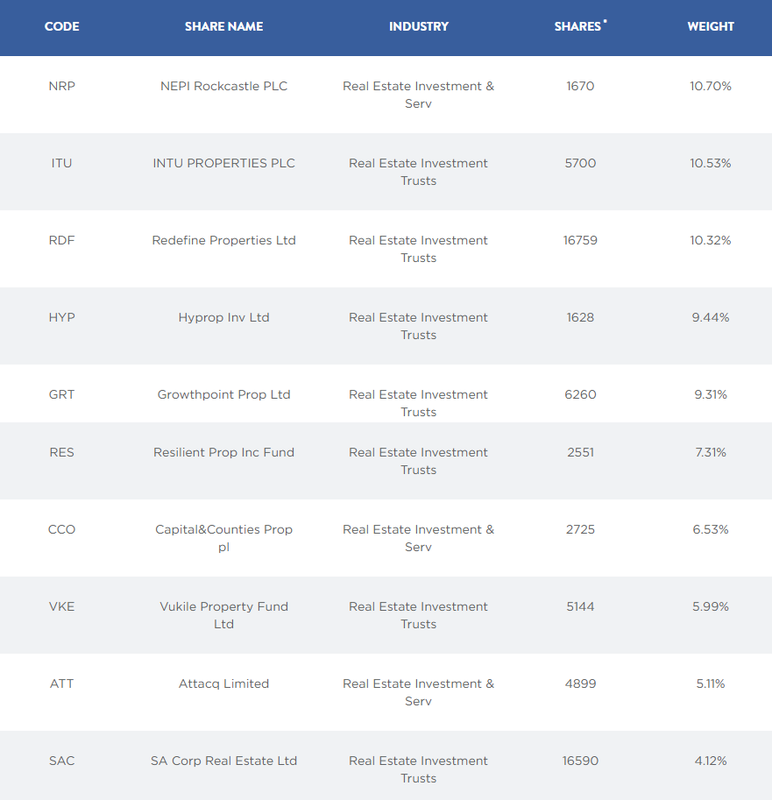 Over the last month, we have profiled three property ETFs from the CoreShares stable. This week, we turn to one of the most popular providers of ETFs in South Africa - Satrix. 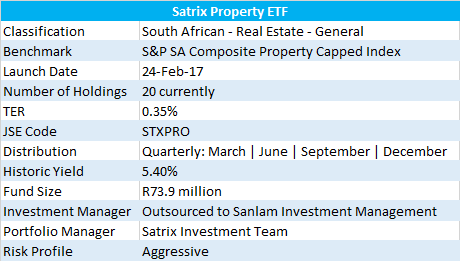 A domestically focused property ETF, the Satrix Property portfolio launched on the 24 February 2017. The ETF is a little over a year old now, and has amassed approximately R74 million in value as per its market capitalisation on 6 April 2018. How is the fund put together? 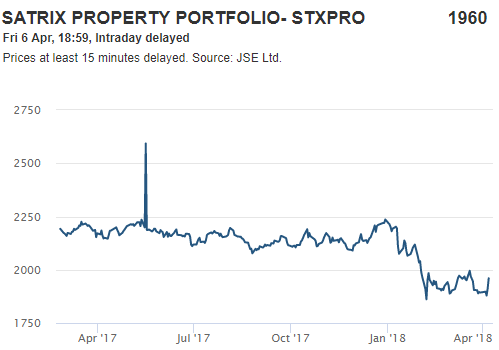 According to the mandate, the Satrix Property ETF is set up to track, as closely as possible, the value of the S&P SA Composite Property Capped Index. The index is tasked with limiting underlying stocks to a maximum weighting of 10% at each rebalancing event (a quarterly occurrence). The quarterly rebalancing also takes into account IPOs and inward foreign listings. Otherwise, reconstitution happens annually, using the data as at the last trading date of July every year. It is worth noting that in order to reduce costs and minimise tracking error, Satrix Property have announced that they may engage in scrip lending activities from time to time. Manufactured (taxable) dividends could arise from such transactions. How does this ETF differ from others? The only ETF in our series that caps the market weighting of an individual stock at 10%, the overall number of underlying shares is currently (as at 6 April 2018) sitting at twenty holdings. Not to be confused with CoreShares PTXTEN that takes the top ten holdings and equally allocates 10% to each share, if the stock doesn’t naturally demand a ten percent or more holding due to its market capitalisation, the allocation to it in the portfolio won’t be upped (only reduced). The next major difference lies in the pricing of the ETF. 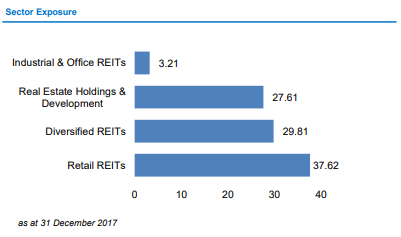 It is the cheapest of all the ETFs with at least a 1-year track record (the Sygnia ETF is targeting a 0.25% total expense ratio (TER) but is not yet a year old). The latest TER as of 6 April 2018 is published as 0.35% on the Satrix website. A final difference lies in the fact that he ETF is also available as a unit trust through the Satrix Investment Plan, either via a debit order for as little as R300 per month or a lump sum of R1,000.